Sometimes, I like to use a high quality optical encoder on a home built rig, to replace one of the cheap 16pulse type encoders commonly available very cheaply. Optical encoders on the other hand are usually quite expensive but can be found occasionally at a good price from say, eBay or other sources. 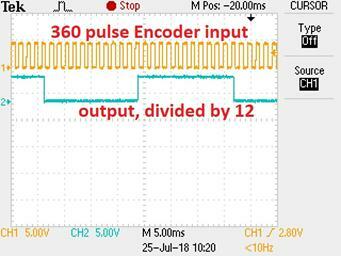 This project allows the use of an optical encoder with a high pulse count per revolution (360) to be used by dividing down the Grey scale output by a fixed number to suit the replacement cheap encoder. Usually 16 or so pulses. 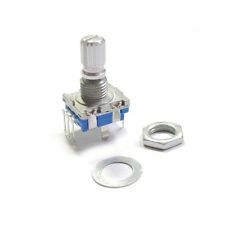 USING A HI-PULSE COUNT ROTARY ENCODER IN PLACE OF LOW COUNT ENCODERS. Many projects use the cheap eBay and other suppliers, grey scale mechanical rotary encoders which usually have about 16 pulses per turn. 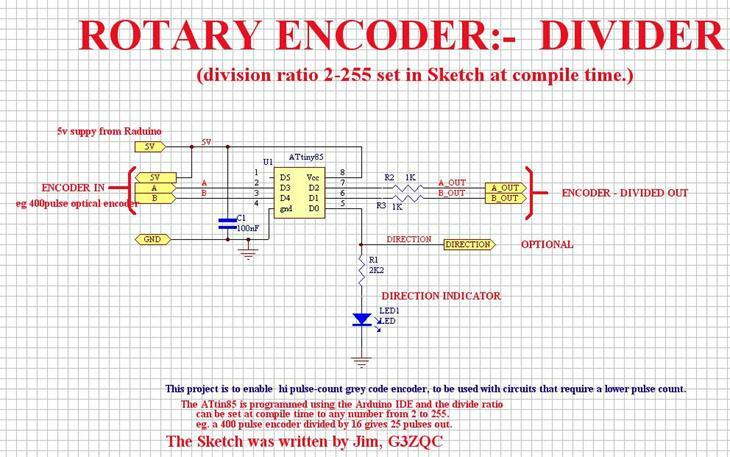 Typical encoder shown below. 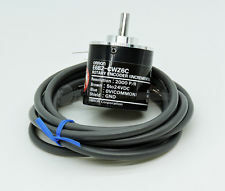 The next tier up from these types of encoders are the high pulse count encoders, often using optical devices internally. 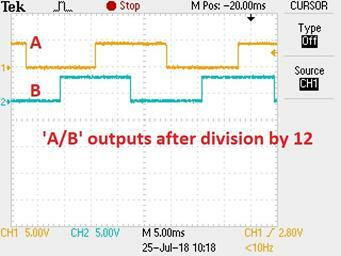 Output pulses per full rotation, can be very high. The particular one I have is a 360pulse type. It’s a very high quality optical device and requires a 5v supply to operate, compared to the cheap types, which are totally passive, relying on switch contacts for their operation. I wanted to use this 360 pulse encoder in a project as a direct replacement for the 16 pulse count type, without having to modify the code in the actual device. In my case, a home brew HF rig. There is a lot of talk about doing this, in a web search, but nobody who has done it, or at least, published any details. 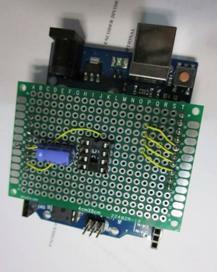 My idea was to use an Arduino to do the job and after a number of attempts, got nowhere useful. More searching found http://ok1fig.nagano.cz/EncoderDivider/EncoderDivider.htm who uses a series of Logic Chips to do it. If you look on his web page you will see it’s relatively complex, with 7 chips on his PCB. His implementation takes up a lot of space. I emailed him asking for further details, but got no reply, so continued with the Arduino idea, using an ATtiny85 Micro, a small under $2, 8 pin chip. (I used the DIP package as it’s easier to physically program.) It’s much more difficult than it seems, and made even more difficult with my limited C++ experience! The smaller code space ATtiny devices should also work but the ‘85’ is probably more commonly available. I am in regular contact with Jim, G3ZQC, who very kindly took a look at my sketch and made some changes. Well, lots of changes. After a few iterations, a very workable solution was made by Jim and it proved to work reliably in my uBITX rig. It currently divides by ‘12’. While it should work with other ratios, it’s only been tested at 12 so far. It gives about 2 KHz of frequency change for example, for a single knob rotation, when used in my uBITX “Raduino” test board. 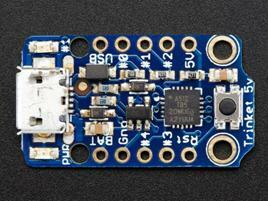 Once programmed, the ATtiny85 is transferred to your own project PCB. You could also use one of the pre-made PCB’s like the Arduino “Trinket” or similar boards found on eBay. This is for information only, as I don’t have one of these boards to test yet. 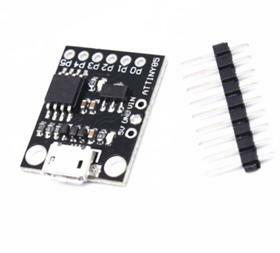 The Trinket uses an ATtiny85 and is shown to the left, note this is the 5v version. There is also a 3.3v version. Check the Adafruit web page for details for programming this part. This is a typical eBay ATtin85 PCB which also has the USB port. Not sure if it's for programming. As far as I am aware, you may be able to program the eBay version in the same manner as the Adafruit one. Refer to the Adafruit web page for programming details. HOWEVER, until I get one, I can't confirm that it has a bootloader. For my own actual build, I just used some prototyping board, available on eBay. The “direction” output shown in the schematic, has not been coded but would be a very simple addition to the Sketch. This could be useful in projects where only direction and a pulse stream are required, not the quadrature pulses above. Simply use one of the outputs plus the direction pin. Here you can see both outputs after the division by 12. Note the quadrature relationship of the Encoder input is maintained in the output. If you download and use this Sketch, we would appreciate feed back on your results.